The deadliest animal in Africa is not a snake, nor a leopard, nor a lion – it’s the hippo, those oddly comic, rotund herbivores that sound like submerged tubas. Hippos kill more people in Africa than any other animal: several hundred per year. In contrast, sharks kill only around ten people per year, worldwide. Hippos don’t even eat the people they kill. They’re vegetarians, emerging at night from ponds and rivers to eat grass. Their beady, sherry-colored eyes don’t see well at all, but their sense of smell is acute. Males defend territory, females their calves. Both can outrun you, and you never know what might set off a 6,000 pound animal that can achieve a speed of 19 mph. In 2002, I was traveling through the Moremi Game Reserve in Botswana on a mobile camping safari. Six people in an open-sided Landcruiser focused their cameras on laid-back hippo blimps floating in a nearby pond. It was that magic half-hour before sunset when the light is golden and incredible – perfect for photographs. A short distance away a male grazed on flowers. I raised my camera. 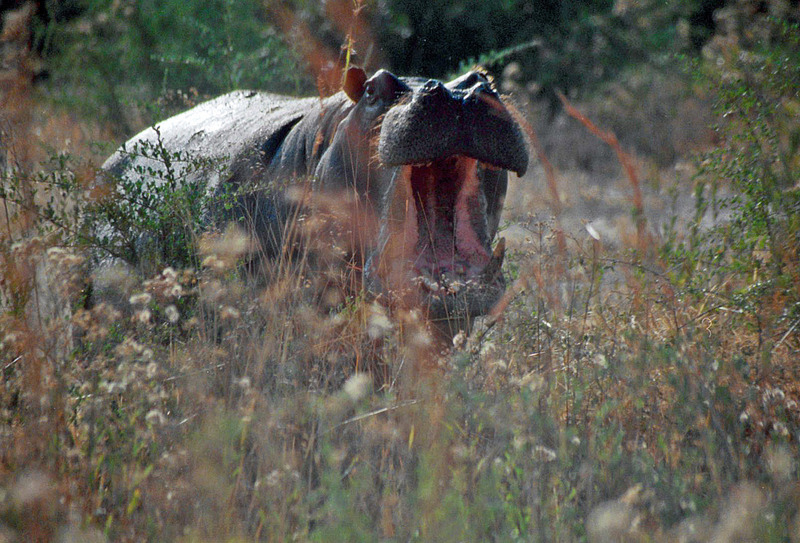 Without warning, the hippo opened his mouth in a threat gesture, displaying his long, razor-sharp canines. A second later, he charged, head swinging side to side like a giant sledgehammer, running directly for us at a surprisingly clip, intent on slamming into our vehicle. He was closing fast. All I could see through my camera lens were those massive incisors, as the camer’s autofocus kept singing out zzzzt zzzt, zzzzzt zzzt. Luckily, the engine of our vehicle started without a cough and the hippo just missed our back bumper. He continued on into the bush for thirty yards before stopping to wonder where we had gone. This is the only picture I have of him, right before he charged. What an amazing photo. I bet you’ll never forget this experience……ever. You’re right! I still hear that dang autofocus, zzzzt, zzzt, as I tried to take a photo down his throat! Hippos are most dangerous if you get between them and the water, so try not to be in that position. I spent the night on a tiny island, with hippos roaring next to me all night (they sound a bit like lions). It was pretty terrifying. I actually like the sound of hippos and love to fall asleep listening to them. Call me crazy, I guess. Males are territorial and aggressive because of that. Females aggressively protect their young. This guy was not quite as big as some of the other bulls, and had a couple of fresh wounds. Speculating he’d just been kicked out of a nearby river and was cranky. It’s also not good to get between a hippo and it’s water source – they feel vulnerable out of water. However, when we came upon this guy, he was in between the water and us – so, theoretically he shouldn’t have charged. I never knew! But I shouldn’t be surprised. The most dangerous animal in Alaska is also a vegetarian. Moose injure and kill far more people than bears. I can believe that…bears are more discreet! Thanks fr checking out my post! Love your comment Harper, it’s absolutely true of course! Yes, our hippos are rather bad-tempered little beasties indeed! HI Cheryl Oh i miss this picture and also what you wrote – i read about the hippo being the most dangerous animal and it really surprised me. I love your site and will continue to come back. Thanks for the comments, Michelle. Hippos are amazing creatures. And thanks for following. This was so fascinating. I would never have imagined that the hippo was the deadliest animal in Africa. Totally love the photo. Thank you for your comments! Harper is such a sweetie, isn’t he? You and I are neighbors; I live in WA state. Pleased to meet you! I’d like to take you to Africa to test that theory, Harper! Fantastic picture Cheryl…you were very brave to stand still long enough to get it!! Actually, I was holding onto a post in the Landcruiser with one hand, trying to get the camera to focus with the other! This photo was right before he charged, so the hippo, the vehicle and I were relatively motionless! I love the colors in your photo! Wonderful pinks and blues…who knew? A hippo’s skin has a wonderful sheen to it,and can almost look purple.